Before cities like Durham or Chapel Hill existed, families developed farms and mills on the Eno River. The Eno River State Park is a favorite Autumn hike for many Triangle families. With winding trails and thick orange foliage, hikers might be surprised to discover ruins of abandoned buildings and centuries-old cemeteries with unmarked graves so old they've begun sinking into the ground. While there is a primary hiking trail through the Cabelands section of the Eno, it won't lead you to the secrets of the backwoods. To find the remnants of former families, you'll need to follow the older trails, far more overgrown and rocky, that indicate where the inhabitants of this area once traveled. On these paths, you'll find the ramshackled remains of the old Cabe Mill, Cabelands graveyard, and the family homestead. Along these same paths, you'll also hear legends of hauntings, shadows, and voices. So I went hiking down the ancient trails of the Eno -- the ones we don't walk every day -- to see what I could find. Before cities like Durham or Chapel Hill were even a blip on the North Carolina landscape, families developed farms and mills on the Eno River. These pre-revolutionary families formed communities, such as West Point and the Cabelands, with everything from schools and blacksmith shops, to post offices and graveyards. According to Dave Cook, Education and Outreach Coordinator for the Eno River Association, "The Piper family ran a school (which once stood) near what is now a picnic area on the Eno River hiking trails." But the story of the Eno goes back even further, by at least 600 years. "Archaeological evidence indicates Native Americans settled on the Eno in the 1400s," said Cook. "German explorer John Lederer found the Eno and Shakori tribes here in 1670." However, he said, "by 1712 all semblance of organized tribes were gone." European settlers, like the Cabe family, moved in and settled along the riverbank. "Hillsborough was the earliest town on the North Carolina frontier after the coastal plain was settled," Cook said. This was largely due to its access to the Eno River. Modern-day maps of the Eno River do their best to highlight landmarks. Places like "Double Chimneys," "Bobbitt's Hole," and "Willie Duke's Bluff" are marked as hidden gems. These unusual names give insight to the lost culture on the Eno's banks. Shooting off the main trail is a thin historic path, overgrown with gnarled roots, that leads to the Cabelands Cemetery. Of the 51 graves in the cemetery, only 12 are marked. At one time, perhaps each buried loved one had a marker, but two centuries of wind, rain, and vandalism have worn them away. 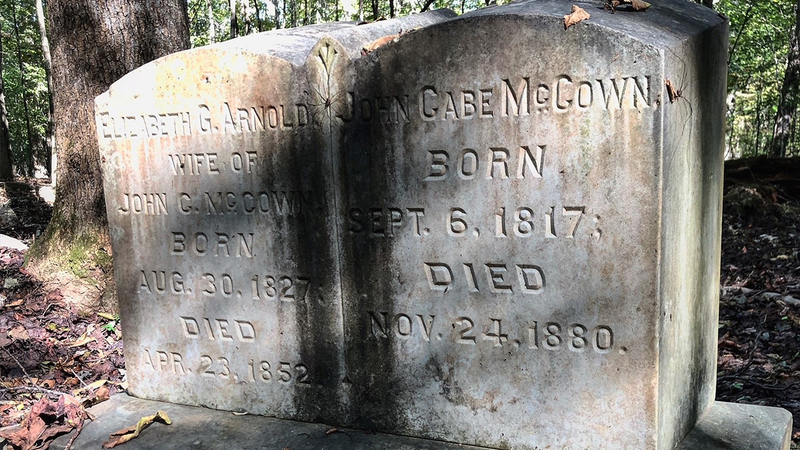 Names and dates traced on the remaining headstones are worn, but tell a story of generations of people who lived on the Eno. According to the Eno River Association, "In 1780 John Cabe became owner of 304 acres along the Eno River." He established a mill that generated great wealth, and when he died, he left behind 4000 acres of land for his family. This area became known as the Cabelands. The names of his descendants are etched into the headstones--Cabe, Shields, and McCown--and date back to the 1700's. The graveyard has held ancestors of the Cabe family for over 200 years. In some places, the ground waves like the ocean where sunken graves indicate rotting caskets beneath. Small stones make human-sized circles around the collapsing ground as if revealing the shape of the person resting beneath. The eerie ambiance has, in recent years, lead to legends of ghosts along the trails of the Cabelands. Just a short trek through the woods, I saw a solid cobblestone structure camouflaged in the trees and brown Autumn brush. This structure, which once gained John Cabe an enormous fortune, now sits on a dried up artery of the Eno. Accessing the archeological remains of the mill means wading through ankle-deep mud. Scurrying up a steep embankment, I was able to peer down into the basement, which is still carved deep into the earth. The walls, around 2 feet wide, stand at least 10 feet above the ground below, and I walked out to a corner to look down into the creek bed. The Eno River Association website points out three arches on the bottom of the mill, noting them as mysterious. Historians are unsure what the small archways were used for, and now there's nobody left to ask. It's hard to believe that, at one time, this structure of moss-covered stone generated wealth for an entire family, and benefited the community. High above the mill, a tall embankment overlooks the Eno River. In the 1800's, the Cabe family lived atop the grassy bluff, and could look down onto their proud mill below. Directly below the flat, oak-trimmed cliffside, a 20 foot drop off ends with the wide river flowing beneath. John Cabe's family owned another mill and homestead just a ways up the river. This entire stretch of land was theirs -- the Cabelands. Over the centuries, visitors have begun sharing haunted legends of the Cabelands section of the Eno River. The Eno River Association website quotes Herb Englishman as saying, "The special spot for feeling energies of the historical site is the homestead area at the edge of the bluff overlooking the Eno River. I have visited numerous times and gotten EVP recordings every time. A man, a woman, and a girl. The girl seems to be the most talkative. She appears as if she was standing right next to you." According to the legend, visitors have been able to make out words like "noise, miller, flags, and years" being whispered nearby as they hike past the historic, but abandoned, sites. Keith Campbell of Wake Paranormal TV is one of several investigators who has visited the site, using ghost-hunting equipment to scan for hot spots and spirits. "I had literally just walked into the cemetery when I saw a shadow figure only ten feet ahead of me," he said, "I didn't even have my gear out yet." Testing the validity of the cemetery's cultural mythos, he did his own EVP recordings near the cemetery, mostly picking up radio signals and talk shows--nothing more unusual than the occasional pop song. Suddenly, a woman's voice wavered through the static. "Hello." The voice vanished into the static. A few minutes later, Campbell heard her again, garbled this time, but clearly the same voice. Several times throughout the hike, the woman's voice would abruptly break through the white noise, but her words were always garbled after that first "Hello." Campbell's tale adds just another chilling chapter to the Cabelands' legends. Perhaps the real ghost story is simply the loss of an entire culture to progress, and the restless spirits are just the remnants of once magnificent buildings crying out to be preserved and used once again. According to Cook, "the growth of Durham, with its rise in industry and as a tobacco center, drained away business from the (Eno communities.)" Durham Station, which had previously been a train stop, officially became a town in 1869. "Once Durham had the railroad, (the Eno communities) could not compete economically." Slowly, farmers and millers were drawn to more urban areas. "By the 1960's, the Eno River Valley was a large wilderness," said Cook. And what of the Cabe family? Christopher Ammon wrote in Hidden Gems of the Eno, "These people were part of two prominent Eno River Families that owned thousands of acres of land, financed several mills, and included state representatives and former mayors of Durham." Yet this wealthy and influential family "faded into obscurity." The rapid progress of Durham's industry replaced farms and mills. Progress leaped forward -- and left the homesteads and mills of the Eno River behind. Perhaps the ghostly "Hello" over the EVP recording was just the voice of the past, checking to see if anyone is still out here who remembers them. "We owe much to the people buried here," wrote Ammon. "The foundations they built and the successes they had in a harsh environment." There are dozens of old structures scattered throughout the trails and banks of the Eno River. We can find them if we walk the old paths -- these quiet reminders of a community and culture that has faded from North Carolina. The 2019 Annual Eno River Calendar is themed "Relics of Those Who Came Before." It features photographer and tales of things people on the Eno left behind, and relics you can still spot along trails in the back country, including cabins, stone foundations, farm implements, transportation routes, quarries, water systems, cemeteries, vehicles, and more.